Anyonita Nibbles | Gluten Free Recipes : Tasty Tuesdays #15 + 9 Recipes You'll Love & New Co-hosts! Tasty Tuesdays #15 + 9 Recipes You'll Love & New Co-hosts! Last week was our biggest week to date with 137 links! :) Woohoo! Let's see if we can do better this week! This link party is all about sharing recipes & food-related posts! Joining in is easy; just click "You are Next" and copy/paste your post's URL. Choose a flattering photo and then click some of the other great posts in the party and meet new bloggers! All Tasty Tuesdays participants get guaranteed Pinterest exposure; we pin every post you share with us and comment on each one too! This week, we decided to go old school and do a classic featured post! Each of us (me, Holly & Jess--who wrapped up their co-hosting last week) chose our top 3 links from the party. Man, was it tough! 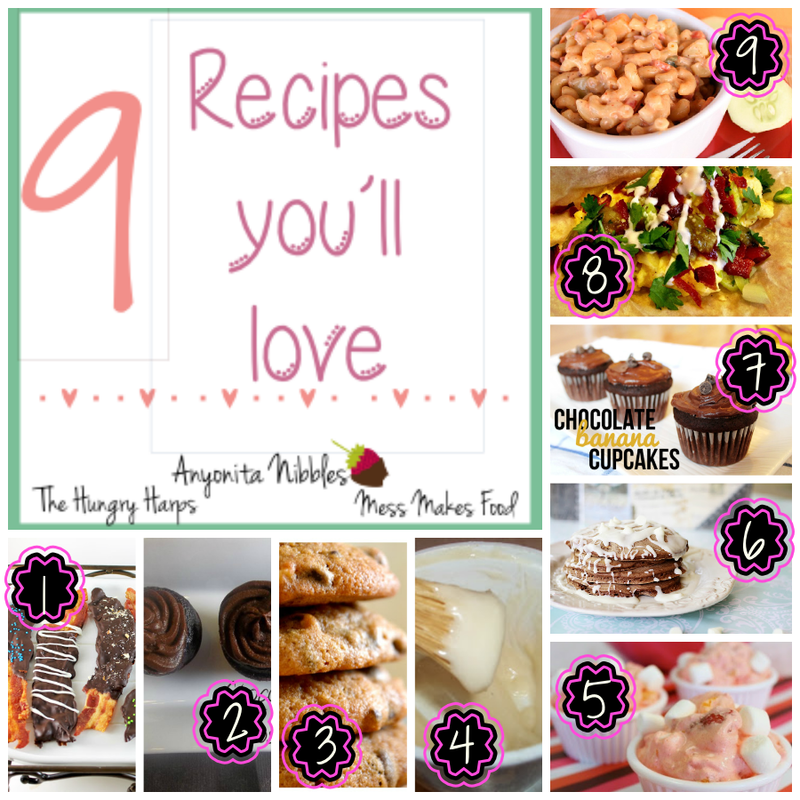 I think these 9 recipes are fabulous and that you'll enjoy them! Don't forget: if you like it, put a pin on it! Wow! Thanks for the bacon feature! I look forward to linking up each Tuesday! What a nice link party you have! I had such a nice time last week I decided to come back for more. Today I'm bringing another muffin recipe, Strawberry Sour Cream Brown Sugar Soaked Oat Muffins, and yes, I know I tend to natter on in my recipe titles. What if I want to make a Strawberry Greek Yogurt Brown Sugar Soaked . . . . . Barley Muffin next strawberry season? I want to keep my options open. Thanks for having 60 characters in the title to allow me to do so. These muffins turn my favorite way to eat fresh berries--dunked in sour cream and then brown sugar--into a soaked oat whole grain snack. They are even good with frozen berries--and the varmints have left my patch alone enough that we're putting berries up this year! For lunch I have to admit I waxed lyrical a bit on my blog. The meal is simple--sautéed beet greens and spring onions seasoned with sherry vinegar and topped with an egg--but knowing that I'd shaken the hands who harvested the beets, harvested the onions, gathered the egg . . . . well, that made me pause and reflect about my meal in a different way. Finally, a pizza dough, made with kale, in case you've ever had more kale than you knew what to do with, and would be enjoying a whole 'nother bag of it in a week! This is just a basic kale pizza dough, and I've got step-by-step instructions w/ photos, plus a few recipe ideas. Thanks for hosting, and lovely to meet Jess, Chandra, Tara, Kristin, and Shea as they start their co-hosting duties! Hi Anyonita! Thanks so much for the feature! You're welcome for the feature! Oooh cauliflower crust??!!? What?! I didn't even know that was possible! Can't wait to read your recipe! :) I've just been informed that there's a kale crust pizza recipe here too ... you should check it out! Thanks so much for stopping by again! Love the features and thanks for hosting another fabulous party! Thank you Anyonita for hosting the party. Have a fantastic day! Hi Anyonita, thanks for hosting the party this week. Have a great week. Thank you letting me Co-Host this month! I am really excited and can't wait to see all the fun and exciting posts that get linked up! Thanks for hosting - following you on EVERY outlet....except the Twitter, I'm not on the Twitter yet. Have a great week!! Welcome, welcome! :) Oooh, the Twitter. I held off for a looooong time & then finally got nipped by the Twitter bug. It's not my favorite, but it can be fun. When it's annoying the stuffing out of me! Thanks so much for all the follows sans Twitter! :) I'll be sure to return them! You're welcome, Ritchil! Glad you stopped by again! Hello Anyonita! New fan here and first time at your party! Thank You for hosting and have a beautiful week. Your party is a lot of fun! Welcome, Lizbeth! :) Hope you enjoy yourself adn I can't wait to see what you post! Thank you, Hannah! :) Burger week was pretty epic; we're going to do it again! Thanks for stopping by again! It is growing quickly, isn't it??! I'm so excited! Anyonita, Thanks so much for stopping by and following today. So happy to meet you and excited to link up to Tasty Tuesday. I will be following you with GFC and Pinterest. Have a great day and see you next Tuesday! Thanks for hosting Ayonita...already following you.....and having fun visiting and following others. Thanks, Nisa! :) Glad to hear you're following other bloggers too! Keep spreading the love! Thanks for featuring my Bacon & Egg Tacos! Thanks again for hosting - so glad to be able to be a part of it! You're welcome! :) I'm glad you made it back to the party! OMGosh at all the great recipes! Thanks for inviting me to your party. Ha I know, there's LOADS again! :) Time to settle in with a cup of tea and peruse! Thanks for stopping by!!! Thanks for the invitation. I shared the broccoli recipe you commented on. I am adding your logo to my blog so I will remember to come back. Thank you Anyonita for initing me here..what a lovely blog you have. I tried linking my recipe here, but it's not working. Will try again tomorrow. Thanks so much for the comment on my blog and for this great party! I'm excited to link up! Thank you for invite, I have linked my Mango Lime Lassi recipe and followed all host on facebook as JcookingOdyssey. Thanks !! Yay! Glad you got it sorted :) I'll be trying that mango lime lass this weekend! Anyonita, thanks for stopping by my blog this week Jenni's Ferris Wheel of Food. I will be joining your party next week. I love this! Have a glorious weekend. You're welcome Jenni! :) Can't wait for you to join in! Have a happy weekend!